Stay up to date with all the latest news, tips and events that are happening around RiverBank Estate! Click here to read the full April edition of the Swan Magazine. 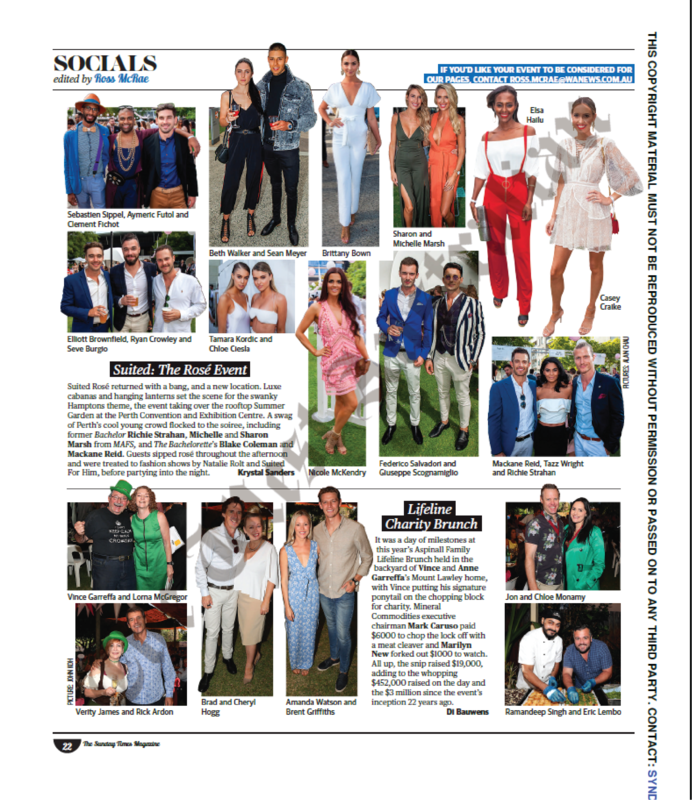 It was a day of milestones at this year’s Aspinall Family Lifeline Brunch held in the backyard of Vince and Anne Garreffa’s Mount Lawley home, with Vince putting his signature ponytail on the chopping block for charity. Mineral Commodities executive chairman Mark Caruso paid $6000 to chop the lock off with a meat cleaver and Marilyn New forked out $1000 to watch. All up, the snip raised $19,000, adding to the whopping $452,000 raised on the day and the $3 million since the event’s inception 22 years ago. 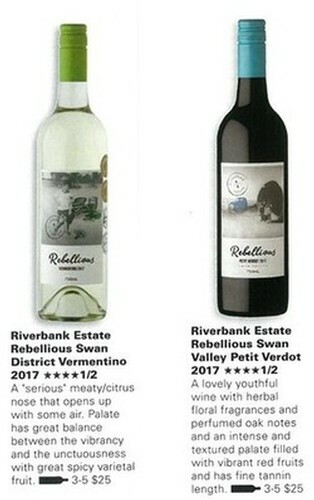 Liquor Barons group recently chose our Vermentino in a blind tasting panel and its feature in On The Vine Magazine and website for 2018. 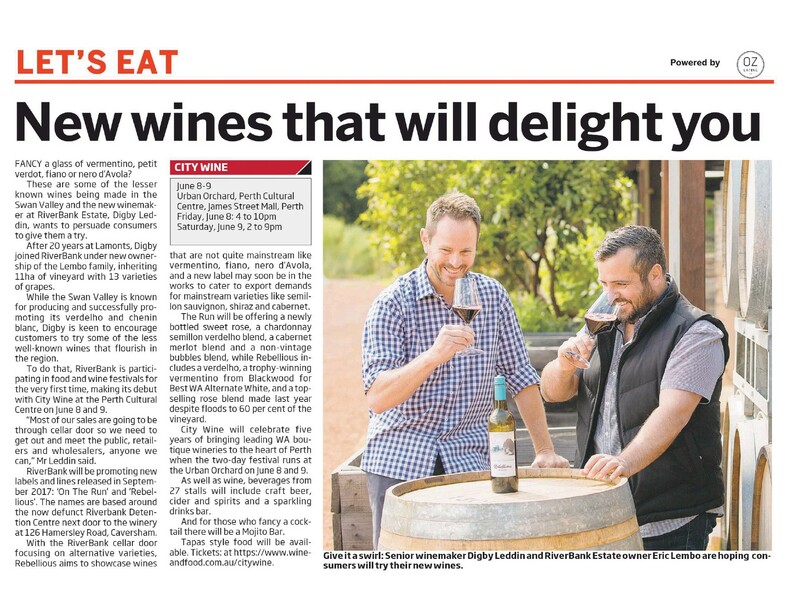 Almost every winery submitted their wines so it was a nice compliment and feels great to be noticed. This Vermentino also beat all the great southern wineries to win Gold and a Trophy in the Geographe Show. 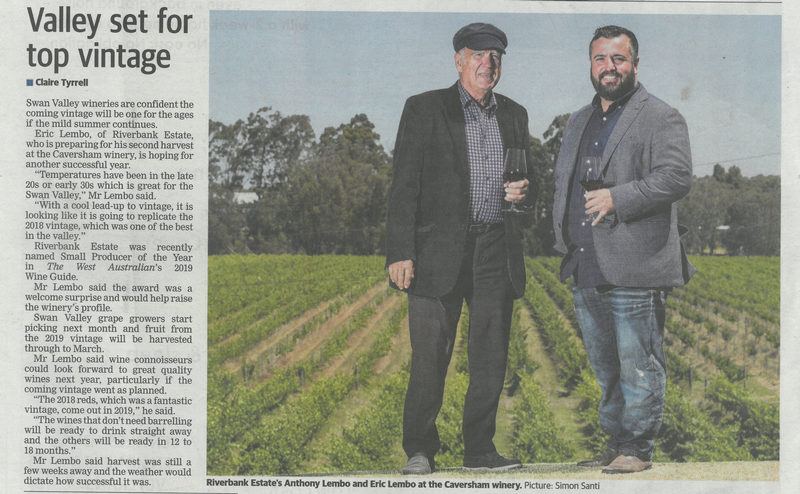 Our wines are now in almost every liquor barons across Western Australia. RiverBank was bought by the Lembo family as a “last-minute purchase” in January. 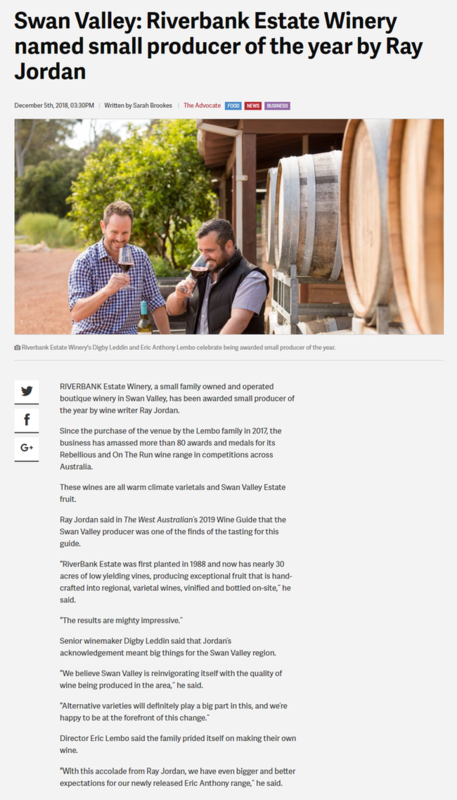 Eric Lembo, an investor who holds an equal share in the business with parents Anthony and Pina, said they saw great potential in the 10.9ha vineyard with almost 30-year-old vines producing low-yielding fruit, carrying more than 15 varieties. 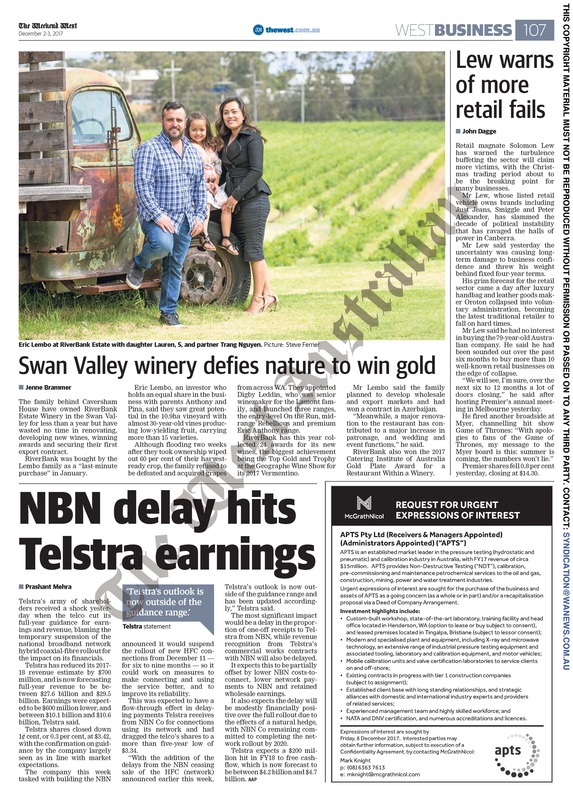 Although flooding two weeks after they took ownership wiped out 60 per cent of their harvest-ready crop, the family refused to be defeated and acquired grapes from across WA. 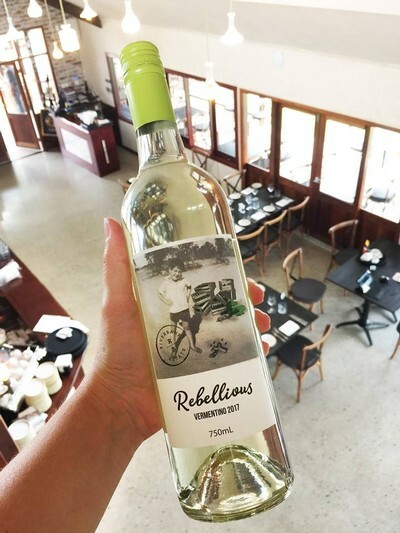 They appointed Digby Leddin, who was senior winemaker for the Lamont family, and launched three ranges, the entry-level On the Run, mid-range Rebellious and premium Eric Anthony range. 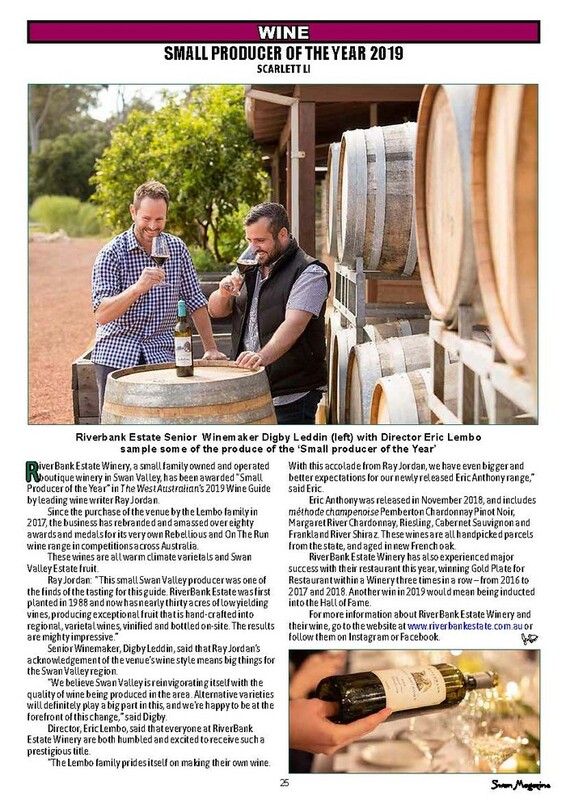 RiverBank has this year collected 24 awards for its new wines, the biggest achievement being the Top Gold and Trophy at the Geographe Wine Show for its 2017 Vermentino. Mr Lembo said the family planned to develop wholesale and export markets and had won a contract in Azerbaijan. “Meanwhile, a major renovation to the restaurant has contributed to a major increase in patronage, and wedding and event functions,” he said. RiverBank also won the 2017 Catering Institute of Australia Gold Plate Award for a Restaurant Within a Winery. Mr Lembo said his family purchased Caversham House in 1998, His father, a mathematics high school teacher and mother, a cake decorator running Avanti Cakes, were initially the major shareholders. Eric was the general manager and his parents helped run the business on top of working their full-time jobs. In 2000, after Eric profited from a successful property development venture, he reinvested the funds back into Caversham House, becoming an equal partner with his parents at just 24 years old. “We all worked seven days a week to build the business up to what it is today,” he said. Caversham House this year won the Gold Plate for Venue Caterer 2017, marking the third consecutive year of winning the category. The win means Caversham House was awarded the prestigious 2017 Prix D’Honneur and the family has been inducted into the Gold Plate Hall of Fame.